Reading and share top 10 famous quotes and sayings about Midlife Crisis by famous authors and people. 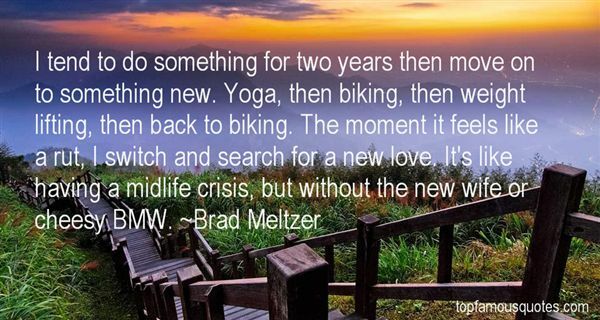 Browse top 10 famous quotes and sayings about Midlife Crisis by most favorite authors. 1. "..sudden attack of culture snobbery is a common affliction among policemen of a certain rank and age; it's like a normal midlife crisis only with more chandeliers and foreign languages." 2. "I tend to do something for two years then move on to something new. Yoga, then biking, then weight lifting, then back to biking. The moment it feels like a rut, I switch and search for a new love. It's like having a midlife crisis, but without the new wife or cheesy BMW." 3. "I figure if Doc is right about the time I have left,I should wrap up my adolescence in the next few days, get into my early productive stages about the third week of school, go through my midlife crisis during Martin Luther King Jr's birthday, redouble my efforts at productivity and think about my legacy, say, Easter, and start cashing in my 401(k)s a couple weeks before Memorial Day." 4. "My generation is having its midlife crisis in its 20s." 5. "I've known plenty of couples who choose to ignore budding problems or dissatisfactions because it's easier in the moment. But too much of that for long enough, and you all of a sudden have a huge problem on your hands, or a midlife crisis, or a broken marriage." 6. "There is some debate in professional circles about whether the so-called "midlife crisis" exists." 7. "Semiotic was the form Zipperstein`s midlife crisis had taken... 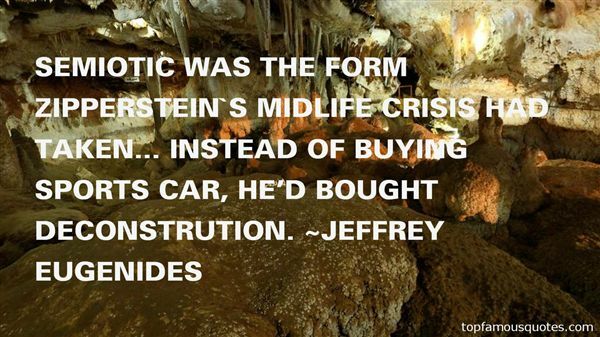 Instead of buying sports car, he'd bought deconstrution." 8. "It's kind of like a midlife crisis kind of thing. When you turn 40, you have to run the marathon, while all the parts still work properly." 9. "I say I have a midlife crisis every time I start and finish a record." 10. 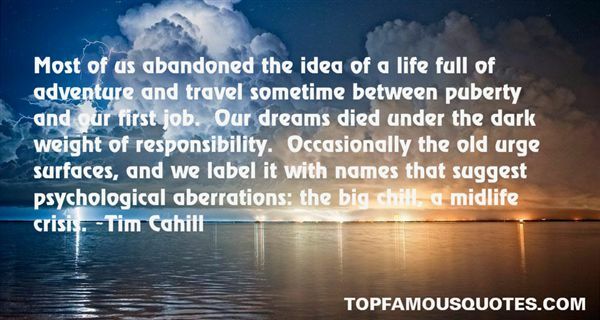 "Most of us abandoned the idea of a life full of adventure and travel sometime between puberty and our first job. Our dreams died under the dark weight of responsibility. Occasionally the old urge surfaces, and we label it with names that suggest psychological aberrations: the big chill, a midlife crisis." What I try to do often when I'm acting and what I like when I'm seeing good acting is how authentic it is. How true is this to what I know of the world that's been created for me? The ultimate test for me is, like, if I heard a clip of it on the radio, I'd like the audience not to know if I'm acting."